L350F is a wheel loader that never compromises. 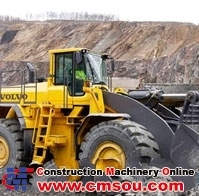 It is a complete whole where the machine, the lift arm system, and the attachment together make up a dynamic unit, a solid combination of power and intelligence. It’s fast, smooth, and stable, and lifts both high and heavy. A durable loader that handles the toughest jobs, around the clock, day or night. * metric hp ** Bucket: 6,9 m3 (8,6 yd3) straight with teeth and segments, Tires 875/65 R33, standard boom.